Info Edge (India) Ltd, the most valued Internet firm listed on the Indian stock exchanges and which runs sites such as Naukri.com and 99acres.com, reported 58 per cent rise in standalone net profit for the quarter ended September 30 to Rs 28.2 crore over the year-ago period, partly boosted by 40 per cent rise in other income (largely dividend from mutual fund), lower finance costs and network charges. Its net revenue also rose a robust 28 per cent to Rs 91 crore during the second quarter over the corresponding period last year, reflecting strong momentum in the Internet business across the country. The company's earnings before other income, interest and exceptional items rose almost 57 per cent for the quarter to Rs 31.27 crore. On a sequential basis, the company's standalone net revenues rose 4 per cent while net profit increased 10 per cent over the first quarter ended June 30, 2011. This indicates an improved performance compared to Q1 FY12 when sequential earnings declined 4 per cent. The company's scrip rose 3.5 per cent to close at Rs 700.1 a share on the BSE on Thursday in a weak Mumbai market. Standalone results of the company include revenues from its primary recruitment business Naukri.com, NaukriGulf.com, Quadrangle, Job Seeker Services and Firstnaukri.com, as well as Jeevansathi.com, 99acres.com, Shiksha.com and Brijj.com. Revenues of its seven subsidiaries are not part of standalone results. 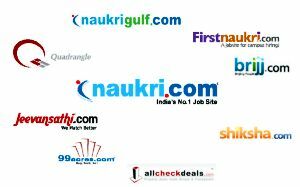 These include Naukri Internet Services Pvt Ltd and Jeevansathi Internet Services Pvt Ltd (which own Internet domain names of Naukri.com and Jeevansathi.com, respectively, as well as related trademarks, while operations are under the parent company), Allcheckdeals, Info Edge (India) Mauritius Ltd (set up to make overseas investments), Info Edge USA Inc., Applect (Meritnation.com) and Etechaces (Policybazaar.com). Info Edge has been active on investments this year. During the last quarter, it announced two follow-on investments â€“ Rs 13.5 crore ($3 million) in Gurgaon-based DC Foodiebay Online Services Pvt Ltd that runs the restaurant directory site Zomato.com and Rs 20 crore ($4.3 million) in New Delhi-based Applect Learning Systems Pvt Ltd that runs Meritnation.com, a portal offering learning solutions in the K-12 segment. The Zomato deal is an all-cash one while the Applect deal is a mix of equity and convertible preference shares. Earlier, the company had infused Rs 9 crore in Mydala.com, run by Delhi-based Kinobeo Software Pvt Ltd, and also put in Rs 10 crore in Policybazaar.com, a part of Etechaces Marketing and Consulting Pvt Ltd. In May 2011, it announced another investment of $3.5 million in online private sales portal 99labels.com. More recently, it raised its exposure in Mydala.com by investing Rs 18 crore through optionally convertible cumulative redeemable preference shares, thus taking its total investment in the firm to Rs 28.1 crore. The company is now eyeing domestic mobile apps start-ups, as well as more consumer Internet firms, Hitesh Oberoi, CEO of Info Edge India, has recently told Techcircle.in.